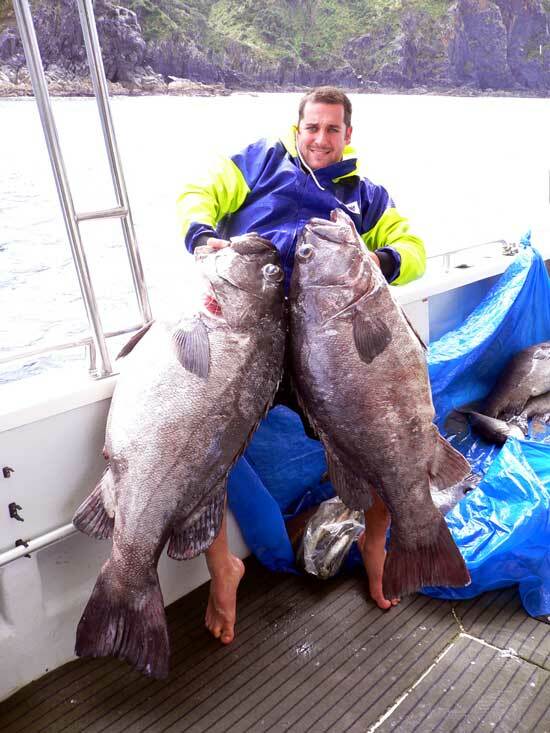 We caught these fish on our annual trip to the Three Kings Islands, aboard the Whakatane charter boat "ORACLE". This is the fourth time I've fished at the Three Kings, but this latest trip is the first time the weather gods have decided to come to the party! Incredibly we had a maximum of 10 knots of wind over the five days we spent up there. It was perfect conditions for bottom fishing! Being my forth trip I knew there are massive bass and kingfish in the area and I also knew that 80lb braid just isn't strong enough. When your team recommended your 130lb PFK Spectra Braid for these huge fish, they also gave me a warning to be carefull not to break my rod! Well I listened and for my money the 130lb is definitely the only way to go! 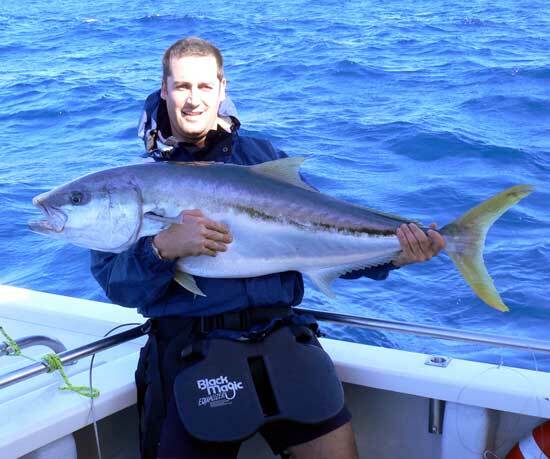 I have had no bust offs and landed many bass up to 48kg and two kingfish, both of which went 35kg, on a dropper. Not bad!! Last year I landed a double header of bass, the biggest of which went 68kg, while the the smaller still weighed in at a very respectable 35kg. This is a massive load, 103kg (230pounds) of bass on one drop. Thats nearly double the rated breaking strain of the 130lb PFK Spectra. You already have the photo of the 68kg bass on your web site. My goal is to land an all tackle world record bass on your 130lb spectra. There are plenty of bass up there that would go 80kg plus, but most people just don't carry the tackle and line capable of landing these huge bass. 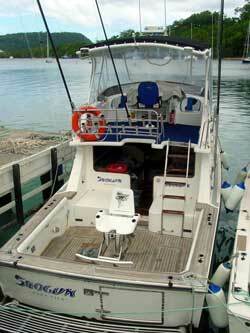 We also landed one striped marlin and tagged four others. It was a pretty good trip all round! I spoke to Len Payne who kite fished 5 kilometers north of the creek last weekend with a bottom longline rig. He reported near 100% hookup rates and wound up catching six good snapper, a few kahawai, lots of gurnard and seven sharks in near gale force winds. It's good to hear the fish are still there in good numbers! Strong north easterlies are predicted for Friday and Saturday, possibly stretching out to Sunday morning so it could be another great weekend for kitefishing on the west coast. I may even have a go on Saturday. 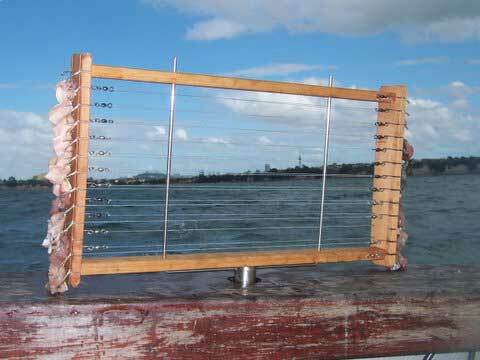 This new stainless steel trace rack holder makes setting and retrieving boat longlines a breeze. The rack is held securely in place and rotates once one side is empty. No more hassles about getting the traces on or off! The new rack holder easily fits into most rod holders and makes single handed longline setting and retrieval of longlines safer and much easier. Give Louie or Rob a ring at the PFK Shop (09)634-5005 for more details. From the New Year through to March the kitefishing in the Mokau area has been a little disappointing for most. A lot of small snapper with a few gurnard and the usual kahawai, but not in the numbers like in previous summers. We had huge seas causing the rivers to be flooded around the end of March, but the area became fishable again early April and catches have improved greatly. Mark Ashcroft from Hamilton caught a couple of 7kg snapper plus numerous smaller ones on his last two visits. I managed a couple over the 20lb mark, one at 10.15kg and the other at 9.68kg. I've had many reports from others fishing the area indicating good catches of 10lb plus snapper. For some reason the bigger fish are early this year, they are normally here around the end of May and stay around till September, October. On the electric kontiki front, two were lost in March due to strong sea currents drifting the hook sections over the rocky areas we have scattered along the Mokau coastline. If it's calm enough to row out a kayak you can sometime retrieve them, but it's extremely risky. I did this for someone not long ago but got smashed coming back in through the surf. The guard around the prop nearly broke my ankle when I got tumbled by the waves. p.s. Editor's note: Congratulations to Geoff and his new bride Heidi. All the best from Paul and Peg. Hi there, I do lots of kite fishing with your kites and I absolutely love it. The problem is, I can't really catch my favourite fish - flounder - this way. I have used both light and spear and drag/set net to catch flounder but I obviously haven't been to the right places, because I haven't had much success. Just wondering if you can help me with some locations in the greater Auckland area re where I can go and what I need to consider, e.g. tides / time of day etc. By the way, I went out to Bethells Beach last night for a spot of kite fishing from 8pm to 1am - that's total devotion for you!! I caught one nice Kahawai on the only set I did but the whole environment was priceless. Obviously it was dark, so I attached lightsticks at the top to my flexikite, where the main line joins the kiteline and just above the milk bottle. It was also a break in the terrible weather we've been having, so I had a starry night sky - the best I've ever seen - for hours. When the kite was out a bit it was hard to distinguish between the stars and the glowsticks. It was a great evening's kitefishing and the one kahawai was good for tonight's dinner. Next time maybe the fishing will be better too. Ed - Can anyone help Neil, if anyone knows about flounder fishing around Auckland, please Contact Us and we will put it on the site. Steven fished a flexiwing rig from Muriwai Beach in late April and caught two Kahawai and a gurnard using trevally for bait. Hi all, by now a few of you would have heard we had a bit of bad luck when in vanuatu last week. 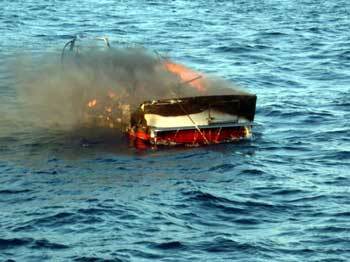 I was doing a Charter Connection aboard Shogun when a fire that started in the starboard engine compartment enveloped the whole boat causing it to eventually sink. While the boat and all the gear was lost, no one was hurt. 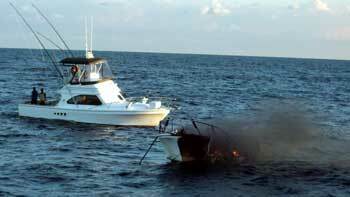 It took just two minutes from when we noticed the fire to when we ended up in the water, clinging to the life raft. Rescue came quickly in the form of a Ni-Van fishing boat who towed us in the life raft clear of the burning boat. My thoughts are for Peter Phillips, Shogun's owner, who had purchased her on Christmas eve and had done a fantastic job bringing it up to scratch and in survey. It was Pete's long awaited 'dream' boat (a 34 foot long Black Watch) and he was very proud of her. Skipper at the time was Matt Smith, brother of Bruce Smith of Striker fame. Pete is already looking for a replacement and has made arrangements for clients to be looked after on other boats in the interim. There is never a dull moment as a fishing mag editor! 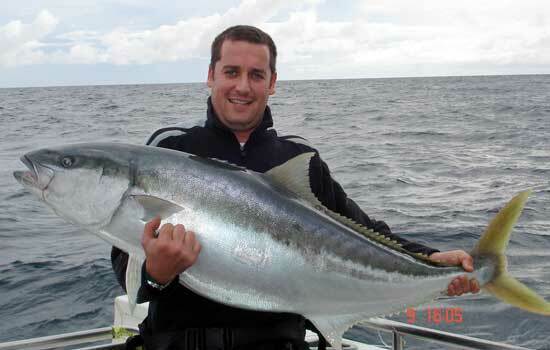 Cheers, Grant Dixon Editor "NZ Fishing News"
PS : Grant has written up this accident at sea in the latest issue of "Fishing News"